Run ApiOmat in your preferred environment, whether that be on-premise, in the cloud or on a PaaS. ApiOmat can be installed on various Linux systems and Windows. Install ApiOmat where you want and even set up a on-premise cloud hybrid set up. ApiOmat is made of up 3 parts – the dashboard, the core (YAMBAS) and the MongoDB. The basic on-premises setup needs at least two application server, accessing a replica set of three MongoDB nodes. An enterprise installation consists of at least 3 application servers and 5 MongoDB nodes to ensure thousands of requests per second can be handled. ApiOmat supports hotfixes and platform updates. Installation manuals for deb, rpm, suse and windows. Individualize your installation to fit your needs. Scale up by starting up new instances of ApiOmat and additional MongoDBs. 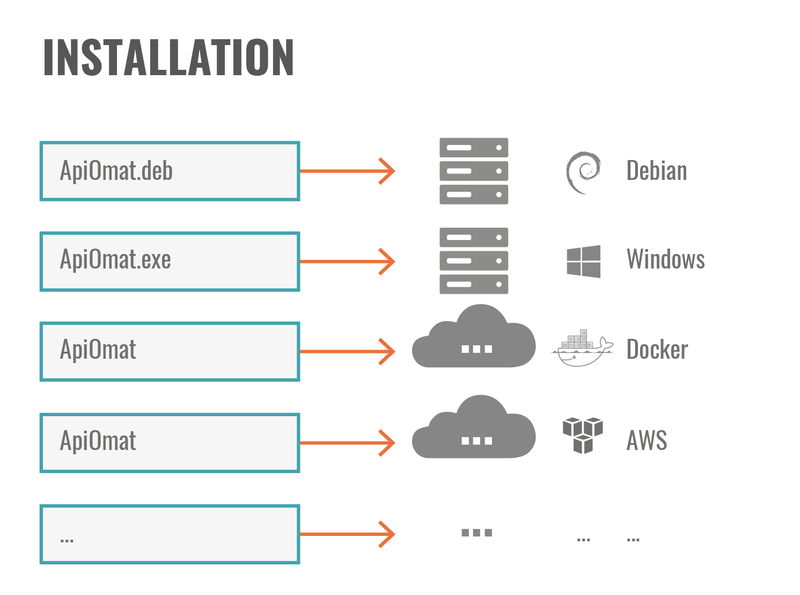 ApiOmat provides installable packages for all major platforms like RPM, DEB and EXE in OS-dependent repositories and via plain FTP. Using one of these packages, ApiOmat can be installed very easily on the supported operating systems. For containerization, also docker images are provided in a repository. Updates and Deinstallation can be executed the same way as done with every other sofware package. ApiOmat consists of multiple packages, the most important are the packages called YAMBAS (core application server) and Dashboard (web frontend). Major third party software parts are Apache Webserver, Apache Tomcat, Oracle Java, PHP and MongoDB. While Apache Webserver and PHP are installed via package dependencies, Tomcat and Java are embedded within the YAMBAS package and MongoDB has to be installed using its own repository. While MongoDB nodes are connected via its own replication mechanism, YAMBAS nodes are connected using Configure Hazelcast, to share information about app activation and connector deploy.